What true dental anxiety entails is a bit more than rational fear of going to the dentist. Even if some people know that they are just going to be examined and not have to actually have a tooth pulled or anything painful, sometimes just the idea of being in the dentist’s chair is enough to completely make someone lose their nerves. 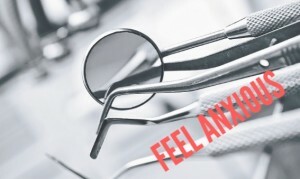 Dental anxiety is considered an unreasonable fear because as adults we’re all just supposed to recognize the need to go to the dentist and accept it. However, for some folks it’s much more complicated than that. 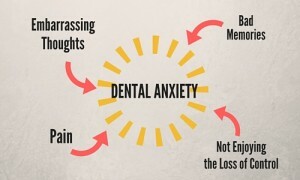 The purest form of dental anxiety is fairly intense, and can be crippling to someone’s health. If someone is beginning to develop infections, intense dental issues, and bad teeth, it really can become a problem, in the end this will lead you to seek the care of an emergency dentist due to avoiding proper care. The patient begins to fully panic at the thought of having to go to the dentist, and it can really become a massive problem in their lives. In it’s heightened state, people with this anxiety actually can suffer from a shorter life span, and you can become physically ill while you are in the waiting room of the office. It becomes just as serious as a fear of flying, if not worse, because dental care is so essential to have a healthy life, that we simply must not do without it. Once fear of dental work begins to really take hold of you emotionally, you may not see a dentist for weeks, months, or even longer. When panels of research professionals have interviewed those with dental anxiety, a number of reasons were found. To get someone help for a condition like this, it’s very important to fully discover what happened and why, to help the anxiety from getting worse, and to hopefully give the patient a chance to ultimately get rid of it. Once they see someone to get help or sort out what is happening and why, the patient will be on the fast track to sitting in the seat with confidence, and developing a high level of trust again for the dentist. here are some reasons why people develop this condition. • Embarrassing thoughts: Sometimes the very outright phobia of the dentist comes from a bit of embarrassment. People may be ashamed of the condition that their teeth are already in, or just feel very put off at the thought of someone strange poking around in there. Having the dentist or their assistant so up close to their face may immediately send them into a bit of a phobia. • Bad Memories: This is very common among folks who used to do just fine at the dentist, but for some reason went once and had an awful experience. Maybe not enough pain medication was used, they weren’t treated with respect, or any other number of events happened. In many cases, the patient may have went for a routine checkup, and then learned they had to have a root canal or painful extraction that very day. • Pain that may occur: Even if the patient has not had an experience in the past where unbearable pain took place, if they have recently been through anything like a broken bone or worse, they may not want to go anywhere they risk encountering pain. Many people who are college aged or above began going to the dentist before some of the amazing advances in technology occurred the last few decades, making visits a little easier to bear and deal with. • Not enjoying the loss of control: When you visit the dentist, you have to sit very still, and perhaps give up a large portion of control, just as you would have to in an airplane. People who have already had anxiety in the past realize that it may be triggered in many ways by loss of control, and not having full knowledge of what exactly is going to happen next. Putting your fate in someone’s hands is simply entirely too difficult for many to handle. For dealing with dental anxiety and the trouble it can bring you, we turned to the vast world of the web for answers. From the cost of the procedure on down to the lack of connection or true relationship with your dentist, it provides some excellent solutions on how to get at the root of the problem and not feel that constant fear in the future. The actual idea of having to get the initial shot to numb your mouth is what many fear, and after a certain amount of time, you may just have to be brave and get through that dreaded moment. Here are some ways to combat dental anxiety that you may find useful. 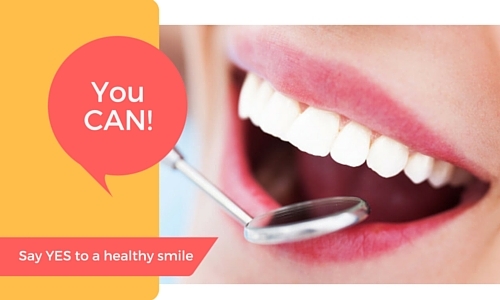 • Tell the dentist about how nervous you are beforehand. Whether it’s on the phone or in the waiting room, let them know that this is an issue for you, because they are very likely to understand. • Sedation Dentistry: You can try to find an office that was designed in a manner which calms. Little things about decor can make a huge difference, as many have found in their quest for the ultimately calming dental clinic. Things with a vintage vibe and other decor that looks like something from a home may bring the patient immediate comfort. • Shop Around: If you want to, meet with a few different dentists before you make your final decision. Getting just a short amount of face time may calm you down in many ways, and you could realize that some dentists have amazing caring capabilities and ways in which their personal touch is soothing right away. • Explore Procedural Options: Talk about all of the sedation options available, there are many these days that could be the best thing you’ve ever asked for! Just as with any surgery or procedure, you can’t help feeling a bit more calmer when you are induced to do so. • Does Scheduling Matter? Figuring out the best time of day for you will work wonders. If you are really dreading the procedure, you may want to get it over with first thing in the morning, and the rest of your day may truly not be as bad as you think it will. • Just Breathe: Practicing very slow and controlled breathing during your period where you are most anxious will help you relax, and give you a much better outlook on your visit. With the goal of slowing your heartbeat down, you will feel at ease for your visit in the chair. • Auditory Distraction: Listening to something distracting could be a great help, many dentists purposefully use comedy routines to lighten the mood a bit. Even rock music can distract you just enough to not be quite as worried about your visit as a whole, or any procedures you may need. • Bring A Friend: Having a familiar face in the waiting room to greet you works wonders as well, because even if things get a little hairy while you are in procedure, you know that a warm face will be there when you are done. Anything you are afraid of doing or that you don’t like is always better with someone you care about then doing it alone.